Packaging Size: Our available packing size 50kg bags / 20 bags in 1 MT. We are offering our customers a wide range of Calcined Dolomite Limestone. It is used in processing of ornamental stone, road stone, and the production of refractory brick. It is found all over the world and are quite common in sedimentary rock sequences. It is called appropriately enough dolomite or dolomitic limestone. Our company has gained name and fame in presenting Calcined Dolomite Powder. Dolomite Lime is Carbonate of Calcium and Magnesium “Ca Mg (CO3)2. The Dolomite is extensively used in Iron & Steel Industries. 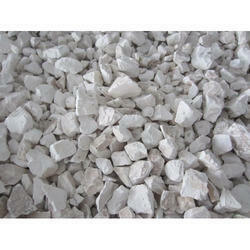 We provide Calcined Dolomite in various sizes as per the need of the clients. Our Dolomite Stones are processed with the latest technology which make them tough and with the capability of being painted perfectly. We provide bulk quantities of Calcined Dolomite to various clients at affordable rates. As a quality focused firm, we are engaged in offering a high-quality range of Calcined Dolomite Stone. We are reputed manufacturers of high grade Calcined Dolomite in the country. Our Dolomite is procured from the finest mines, due to which it has precise chemical composition and physical properties.